What follows is what happens after Mike and I have written the overall outlines, after we’ve plotted out each issue and each moment in each those issues. First off, I take our detailed outline and convert it into a script. There is a fair amount of descriptions and dialogue in the outline so this is an easy process. 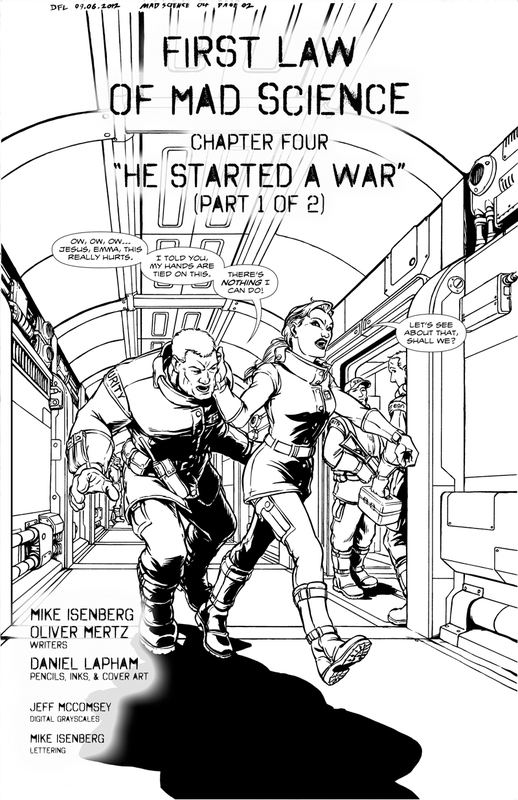 From there, Mike and I both take passes on revising descriptions, dialogue, and anything else we see fit to change. Then we do a few final passes of the script together. We actually read through, trading off panel for panel with each other, making changes as we go. There is audio recordings of this from our Skype calls but no one wants to hear that. After that, we’re ready to send the script over to Daniel. Daniel then comes back to us with the layouts a short while after getting the script. Getting the layouts from Daniel is a cool stage because Mike and I get to see the script, story, and character come to life in a rough form. Essentially, Daniel takes the script and breaks down each page into where he wants to put the panels. Of course, he also designs how each individual panel will look. These are the visual blueprints. This page only has the one panel but I think you can get the idea. 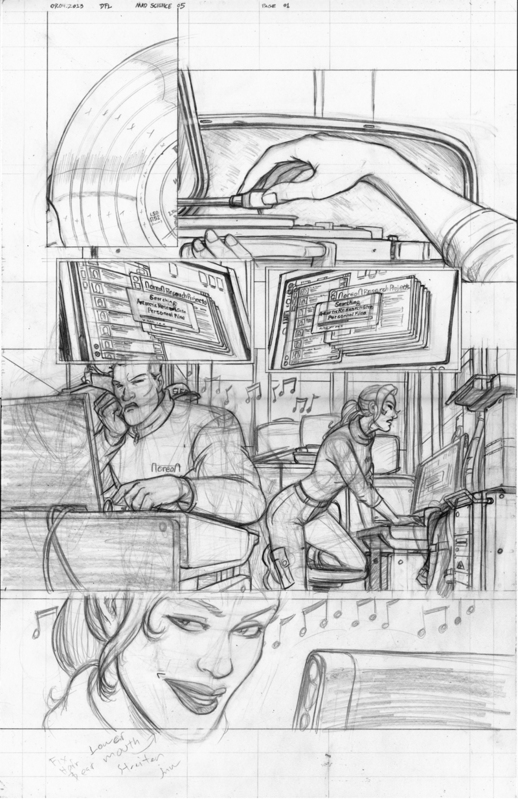 After Mike and I have looked over the layouts and given Daniel any feedback we have about changes to certain pages or anything like that, Daniel starts to put together the pencils. The pencil stage is where things really take shape. 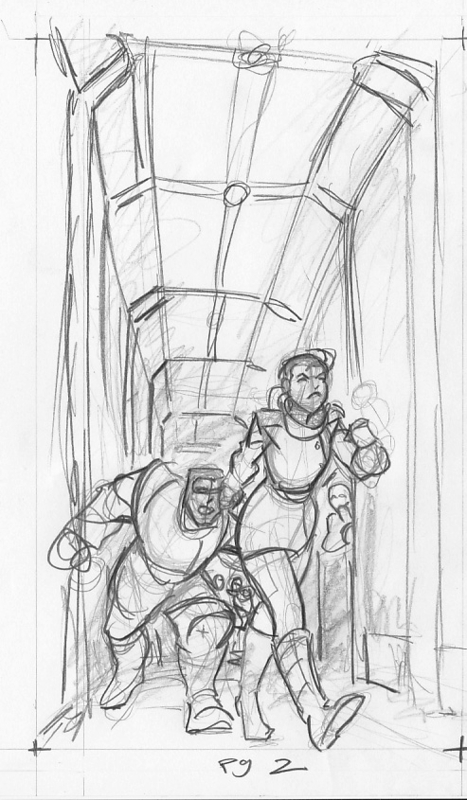 Those rough layouts become specific, beautiful images. Daniel does an incredible job bringing emotion and life to the characters and settings. Daniel then sends the pencil pages over to Mike and me for approval. 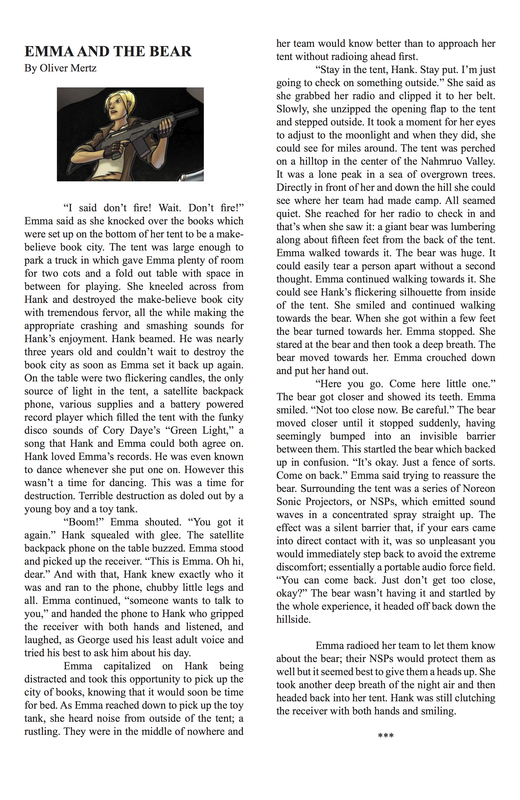 We usually approve them fairly quickly as the pages always look great. After a the pages are approved, Daniel then starts inking. The inks stage is great because this is where everything is locked in. The inks also give depth, tone, and mood. At this point the page could very well be done because everything is so polished. 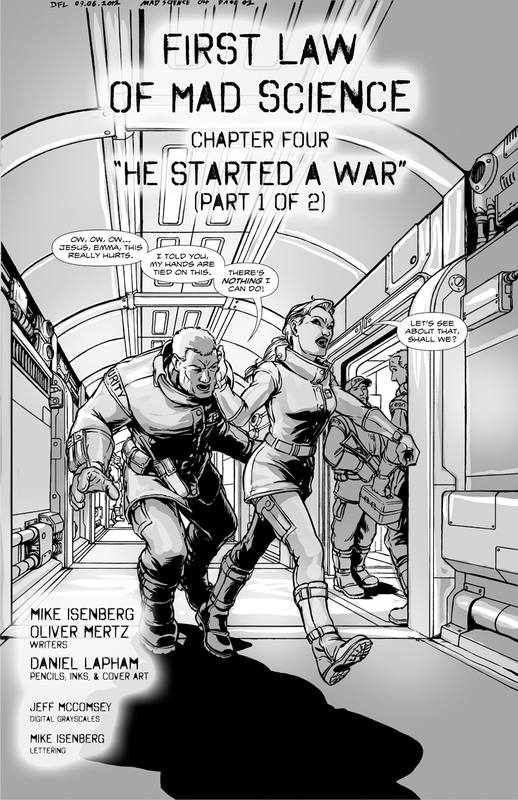 After we get the inked pages from Daniel, we send them over to Jeff to do grayscales. 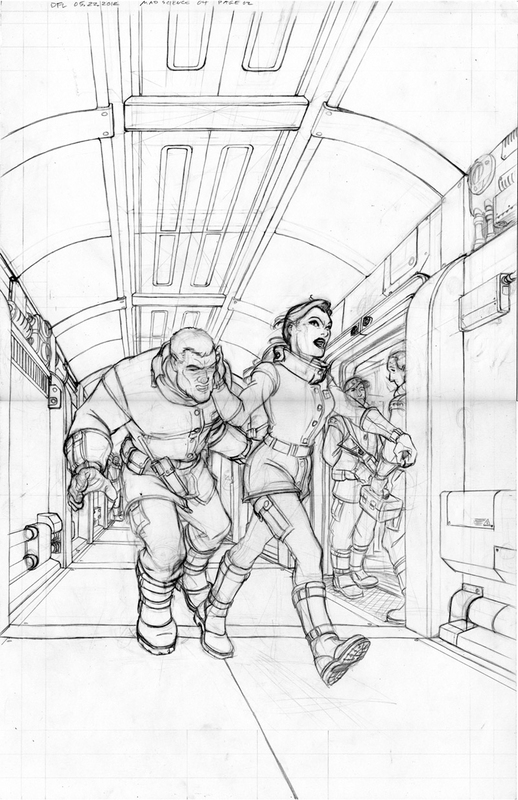 Jeff does an amazing job building texture and depth with the grays. 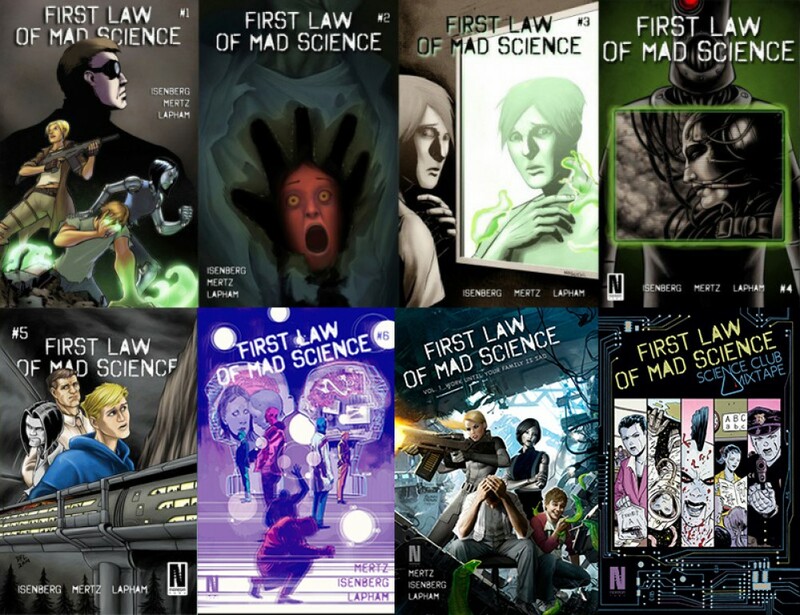 This is the final stage for the printed version of First Law of Mad Science. 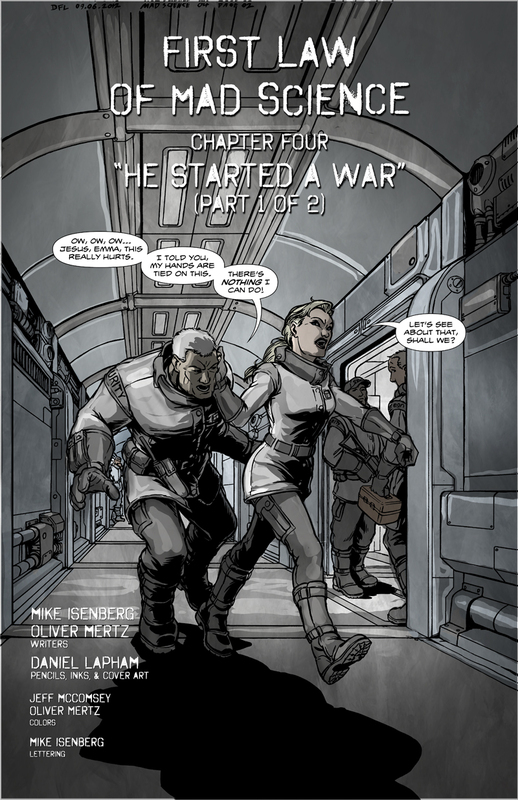 For the ComiXology digital edition, black and white vs color is not an issue the way it is with printing physical copies. So a little while ago I decided to add some color to our dear book. I work in Photoshop to add not only color but a few extra texture layers as well. I’ll be honest, what I do is nothing compared to what Daniel and Jeff do. They are real artists. I am just lucky that I get to color over their incredible work. Essentially, I add flat color, which is transformed by Jeff’s grayscale work into a dynamic combination of color shades. And that’s about it. There’s a lot more to the process, and to all of those individual stages mentioned above, but that will have to wait for another time. We’ll be at the Boston Comic Con in August! The site got a little messed up after some internet users who were up to no good got their hands on it. That’s all in the past. We’re back up and running. I’m sure we’ll be neglicting this site, just as we usually do, in no time! It’ll take us a while to fix up the site so please bear with us.